Bathtime is my most favourite time. The aroma of the room, the steam, comfort, it's relaxing to just lay back and soak and age temporarily due to the skin resembling a prune. 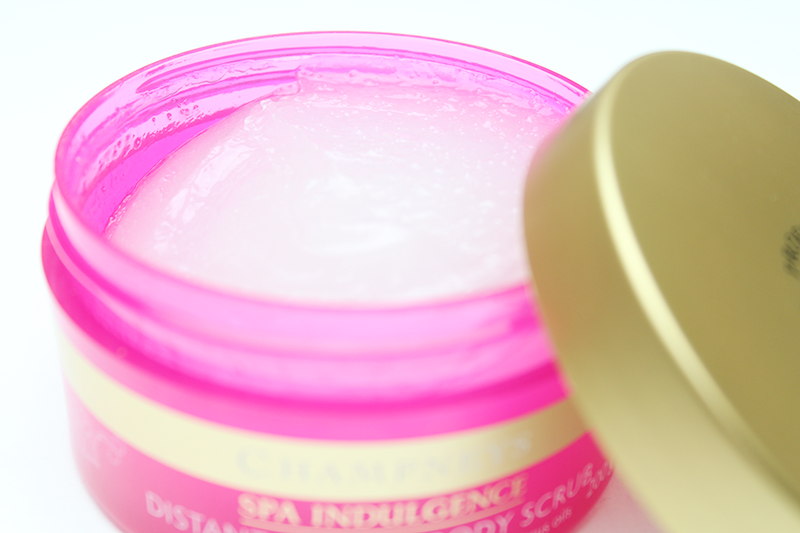 Champneys always have great products that smell luxurious. Perfect for presents or just to pamper yourself. My nan had the Oriental Opulence range, just gorgeous. This one just tops it, I'm already such a sucker for fruity scents and this one is bursting with fruity - citrus scents that I'm surprised I haven't used these all up in one go. Over indulging maybe but the smell and benefits are just worth it. This comes dispenses by a pump and is quite frothy, the smell is instant. It lathers up very well and not to mention it feels soft and moisturising. I find it's good for the morning, to feel more awake but even at night can give a nice pick me up. Ingredients : Aqua (Water), Ammonium laureth sulfate, Sodium laureth sulfate, Glycerin, Cocamidopropyl betaine, Parfum (Fragrance), Sodium chloride, PEG-40 hydrogenated castor oil, PEG-7 glyceryl cocoate, Dipropylene glycol, Ammonium sulfate, Laureth-3, Phenoxyethanol, PEG-60 almond glycerides, Styrene/acrylates copolymer, Sodium sulfate, Limonene, Coco-glucoside, Disodium EDTA, Benzotriazolyl dodecyl p-cresol, Propylene glycol, Citrus grandis (Grapefruit) peel oil, Citrus limon (Lemon) peel oil, Methylisothiazolinone, Alcohol denat., Benzoic acid, Denatonium benzoate extract, Methyl hydrogenated rosinate, Mangifera indica fruit extract, Passiflora edulis fruit extract, Sorbitol, Cl 17200 (Red 33). The texture to this is not like any body scrub I have used before, it's very smooth, more of a gel appearance. Not as gritty as others but it's still effective. This has a blend of grapefruit, lemon and orange peel oils, mango and passion fruit extract ... mmmm. When I massage this into my damp skin, I get a warming effect to the skin, nothing irritating or distinctly bad afterwards, it doesn't say it's meant to be warming. Yet that is what happens to me. Since using this a couple of times and following up with the next product. My skin feels fresh and smooth - I adore. Ingredients : Butylene glycol, Glycerin, Paraffinum liquidum (Mineral oil), Sucrose, Maris sal (Sea salt), Silica, Butyrospermum parkii (Shea) butter, Dimethicone, Cetearyl alcohol, Parfum (Fragrance), Polysorbate 20, Cyclopentasiloxane, Glyceryl stearate, PEG-100 stearate, Aqua (Water), Cyclohexasiloxane, Theobroma cacao (Cocoa) seed butter, Dipropylene glycol, Acrylates copolymer, Tocopheryl acetate, Limonene, citrus grandis (Grapefruit) peel oil, Propylene glycol, Citrus limon (Lemon) peel oil, Sodium dehydroacetate, Laureth-21, Cedrus atlantica bark oil, Citrus aurantium dulcis (Orange) fruit extract, Methyl hydrogenated rosinate, Mangifera indica fruit extract, Denatonium benzoate, Passiflora edulis fruit extract, Sorbitol, Tocopherol, Citric acid. O.k. when I applied this dry oil that has grapefruit, lemon, orange and cedarwood oils which combined with passion fruit and mango you've once again got this uplifting, fresh scent, this aroma not overbearing, just a favourite. What I loved was when my skin is a little damp after the exfoliating, I spray it on..I took the image above before I massaged it in just because I love the way it made my legs looked so toned. In the morning my legs still felt smooth and the scent was still there. Heavenly. Ingredients : Caprylic/capric triglyceride, Cyclopentasiloxane, C12-15 alkyl benzoate, Cyclohexasiloxane, Perfum (Fragrance), Polysorbate 85, Dipropylene glycol, Propylen glycol, Tocopheryl acetate, Aqua (Water), Limonene, Citrus grandis (Grapefruit) peel oil, Citrus limon (Lemon) peel oil, Mangifera indica fruit extract, Hexyl cinnamal, Passiflora edulis fruit extract, Sorbitol, Linalool, Cedrus atlantica bark oil, Citrus aurantium dulcis (Orange) fruit extract, Denatonium benzoate, Methyl hydrogenated rosinate. Nobody will dislike you at Christmas for these as gifts! Heck I'd accept a hamper ... any takers?! Wow, Sounds pretty dazzling..... Definitely worth trying though! Good looking images too.